With some friends we are setting up a local informal environmentalist group, with the aim of pushing forward good practices, spread sustainability, ecological awareness, and this kind of #solarpunk. stuff. So far we are planning of doing #permaculture , #food production, #composting workshops, #Seed library, #GuerrillaGardening, collective purchase from #RegenerativeAgriculture farms, but we&apos;d like to have more on the todo list. Help me get out of our echo chamber, and give me your ideas about more activities we could engage ourselves and the local communities in. Thanks for your answer. self watering beds and cultivation stuff is taken care of, energy production actually was not in our radar... but it goes right in the proposal, I think is a great idea and we could get "techies" into it. Mesh network is something I&apos;m already thinking of doing with my hacklab, in Italy we have a big network already (ninux) but is difficult to set up the antennas as it&apos;s very hilly/mountains around here... it is related though, I agree and will put some more effort into it! @arteteco you could promote setting up resilient mesh networks for low-cost/free accessible internet access in your community. Not too hard for someone with some tech know-how. @tulsi Thanks, here in Italy we have ninux(http://ninux.org/FrontPage) which is a similar project. I&apos;m doing that with my hacklab though, didn&apos;t think of integrating it with the environmentalist group... it may be nice to have the two working together maybe! @tulsi That would be more time and resource consuming that we can afford at the beginning (we don&apos;t have much money and still haven&apos;t got a plan to become economically sustainable), but it goes into the todo list for when we&apos;ll feel more established, thanks! @arteteco i was just reading this yesterday. if you haven't, maybe you'll find some good ideas there. it seems to be oriented towards practical matters. @queerplant Seems like an interesting source of ideas, I&apos;ll give it a nice read later and give you some feedback. @artsyhonker I usually am not fond of the transition town, both because the possible energy crises doesn&apos;t seem like the major problem in the years to come, and because I am not used to work in bigger scale, but that blinded me in not looking up their work for some ideas, which is a great tip. Thanks! @arteteco One of the local groups gives away compost worms a most local fairs and street festivals. @drewfer I plan to give away much of my worms in some worm-composting workshops, but I haven&apos;t thought about doing it in fairs, as a chance to chit chat and raise awareness (beside the practical benefit of having more people composting their scraps). Great idea! @arteteco Giving out pamphlets or flyers for your events at the farmers market might also work. The kind of people that attend those would probably be interested in doing some 5-gal bucket patio-gardening. @drewfer You mean using paper you can dispose of by planting it? Disposal is not the only problem in general, the energy consumption, the resource depletion for the production and so on are also to be considered, and usually is more savvy to just refuse to use something. At least, we&apos;d like to try to set the best examples we can, both in our way of action and our own life. @arteteco Our food group has a food tree project - we buy/propagate food bushes/trees and give away, along with educational opps. We also have an emergency seed bank (stored at a number of trusted community members homes, in their freezers), with larger quantities of basics and easy to grow veg. in case our community were left to our own devices due to big emergency of some sort. We're quite remote, so not out of the question. Costs little to buy bulk seed and print instructions. @Nihola An emergency seed bank is something I haven&apos;t thought about, my seed library idea was mostly to keep some local varieties from extinction. I get the real necessity for seeds which is not only a fancy single specimen, but also what we need to plant crops, and I&apos;ll push to upscale the seed bank in that direction. Buy/propagate trees and plants in general is a great idea, and possibly even a way to get some economical help from people (easier to get some contribution if we are offering plants in exchange, and we can have people to be guardians of local varieties and useful plants). @arteteco we've gotten grants for both projects, and some donations. Again, you can get good deals when you buy in bulk. If you headed in that direction I'd be happy to share more details...learn from our mistakes/experience. @Nihola can I ask you what part of the world are you located? @arteteco Canada, BC, Kootenays, in the mountains. @arteteco To help the human race survive so it can go on torturing and killing its own kind. A worthy effort. I am not sure I understand what you mean. Are you saying that by trying to have the environment restored we are also prolonging our life as a species and therefore also our violent behaviors? @arteteco Let's just take the USA but applicable to many societies. In the 50's and 60's they had registration, forced castration, jail terms, censorship, invasion of privacy in contradiction to its stated principles, tacit state approval of street beating (aka torture). This is for gays. Then the gays won their rights starting in 1971. But guess what the US govt just shifted to child molesters, so called. Pedophilia had always been illegal, but just after they lost the gays as scapegoats, the US govt created a national hysteria about it. You may have no idea how terrifed the American population is now. The reason for these scapegoat campaigns? To distract the public from the failings of government. These occurred in times of abundance not scarcity. So this sort of pattern will be repeated ad eternam. Should this species really be encouraged to survive? @monsterbater Oh, I see what you mean. Well, when you cherry-pick facts from history you can make it look like it&apos;s going for the best or worst without much effort, and in both cases it would be so simplified to be just wrong. That doesn&apos;t answer your question: I&apos;m not sure that I want to take a position of whether humans beings should be encouraged to survive. But it would be a bit arrogant to put the human at the center of everything. What I do feel is that we are taking the rest of the biosphere with us, and we have immense power that, if they went in the right direction, could at least amend much of our past 2000 years destruction. At the end of the day, is either that or keep going in this path, killing more species, creating more instability, eventually making a hell even for tardigrades. So, as a human being, I&apos;d like to roll my sleeves and see what I can do to make it better. 3. If humans do not survive, it makes no difference about the rest of the biosphere. Other living things will survive or new ones will evolve in the same way the old ones did. 4. So as a human being you have conceded that making it better is impossible, you just want to make it so that the same psychotics can continue their dysfunctional existence, and in fact you have just come full circle to restate the same faulty. 5. If you really want to make things better you would have to pick up the biggest most letheal weapon you could find and aim it at our rulers and insist that when they say they give us the rule of law including equality under that law, they really do. You can't make things better without getting your hands dirty. 1. It is. I can say "slavery was abolished" and "women can vote" and "we get to say more or less what we want without being executed", and so on. And in both your and my example, it wouldn&apos;t tell us much: there are a lot of explanations, backgrounds and case-by-case analysis to be done that don&apos;t resolve in a single, simple, univocally true pattern. 3. Sure it makes a difference. If we are here, we interact with the rest of the biosphere, if we are not here, we don&apos;t. That makes a difference for every single being we come in contact with, directly or indirectly. In any ecosystem if you take a species out it makes a difference. 4. I didn&apos;t say it is impossible, quite the opposite. It is doable, we have quite some means to make things better, and that was kind of my point. 5. Don&apos;t you think that&apos;s a bit simplicistic? "give us the rule of law", "taking all the rulers and pointing the most lethal weapon there is in their face", that&apos;s not a plan, that&apos;s not an analysis, sorry, that&apos;s a fantasy. I&apos;m not saying involving higher powers is something that should be ruled out, each one has his/her line of action, that is at the moment not mine. 1. No it is not cherry picking, it is taking a plane up to 5000 feet and seeing that the peaceful Disneyland resort you thought you lived in is really a raging hellhole. Let's just take one single point, the darling of politico-academic types. "Slavery was abolished" No it was not and still is quite prevalent. Check GM Trevalyan's remarks on wage slavery in his shorter history of England. Or take note: US prisons are the only place where slavery is still officially legal in the US (2018). Now you see the real reason why the US has the highest prison population in the world. The same reason Stalin made 25 years the mandatory minimum sentence to the gulags after 1949. Let's take your second point. Sure women can vote, blacks can vote, but how come with the enlargement of the franchisement, things just don't seem to get better? That is after all the ultimate rationale for democracy. Drug addiction? Gang membership? A better society? "there are a lot of explanations, backgrounds and case-by-case analysis to be done that don't resolve in a single, simple, univocally true pattern...."
This is always the argument they use to evade responsibility for the condition of society. The excuse goes that since these social problems are so complex in their causes, we the professionals tasked with solving them cannot be held responsible. @monsterbater I don&apos;t feel this discussion is going anywhere. You make the world a better place with your criteria, points of view and analysis, I&apos;ll do the same. @arteteco I understand. Your action in life requires a raison d'etre, however illusory. When I demolish that, you have no project/goal to motivate you when you wake up in the morning. So in order to retain your reason for living, you must cut off discussion that threatens it. One could ponder the merits of nurturing a false hope if it keeps you alive, kind of like that O Henry story about the flower on a snow night. @arteteco how about a podcast and/or peertube channel on these topics? @absolutus Hi, thanks for your input! A little note about it that I&apos;d like to share. We thought about how much effort we want to put into media, and we concluded that there are enough tutorials, podcasts, people talking about the matter on the net. There is a weird perception that is "if you are aware of a problem you solved it", and spreading "awareness" seems to many like solving problems. That is not necessarily true, unfortunately. It is an important first step, but until you plant that tree, recognizing the importance of trees is just knowledge. We decided to prioritize getting our hands dirty, growing actual food, planting actual flowers for impollinators, creating afk social networks, make real contacts with communities, instead of doing symbolic action that are just good to "spread a message" on the web. @arteteco yeh makes sense, I like your approach! I dunno, lots of other things. Best of luck with project! What you suggest are valuable contribution to any community, and I&apos;ll put it in the todo hoping that we&apos;ll find the energy and people to do such things. What we can do, now that you make me think about it, is do more one shot thing, like a properly organized compost toilet workshop, or graywater phytodepuration workshop, so that interested people from outside the city could join us. That could be a more immediately doable thing. Thanks for your input, very appreciated. @arteteco love the idea of workshops. I want more skill shares like that in our community. Less imposing in terms of time-commitment, establishes regularity (weekly, monthly? ), encourages rotation of facilitation / leadership roles, let's ppl engaged where theyre most interested or could really do more learning. Sounds great, hope it goes well! @slackz Thanks for your encouragement, I&apos;ll do my best! encouraging them to keep in contact with others doing the same? yes! @soontobe Ah, we&apos;ll *surely* try to get people to grow stuff. Anything. @arteteco a neighborhood sustainability group in my area does an annual skill-share fair - people volunteer to teach things like tool sharpening, beekeeping, mushroom cultivation, and crochet. the seed swap library sets up a table and there's a clothing exchange. it's a really great community event! I think having everything on one day makes it easier to attract a big audience. @mcmoots Ah, so there actually is a thing like "neighborhood sustainability group". I didn&apos;t know how to define us. Do you have a link to their works, to get some more inspiration? @shellkr I&apos;ll talk about it with my hacklab, it&apos;s also a good excuse to have them and this new environmentalist group to work together. @arteteco I collect resources for stuff like that at http://socalledunitedstates.tumblr.com/tagged/practical feel free to look through that! Good luck!! @socalledunitedstates Your blog is very nice, a lot of cool ideas here! Thanks for writing it and posting it to me. The Helioforge looks awesome. @glintacp Hi, thanks for your input! Is a bit outside of our scope, there already are spaces who are more concerned with giving free medical attention and help to people. What we could do is cooperate with them and grow some medicinal plants, if they need it (my bachelor is in herbalism, should be my field). That could help us reduce the terrible pharmaceutical waste that goes in the sewer every day, and bringing people closer to plant. Usually insects love medicinal plants flowers, so it&apos;s a win-win. I'm fixing a bunch of bikes (most of them from the trash) to give away once the school year starts and all the students come back. If you can recover abandoned bikes, and someone enjoys fixing them, that could be worthwhile for you as well. @tilag Thanks, we already have 2 (kind of) community owned bicycle workshops, where we put spare parts, fix them and such. I plan to work closely with them, as we&apos;ll need some cargo and stuff to move food and plants around. Now that you have me to think about it, there is quite a movement doing cycle-powered agricultural tools. Could be a nice a idea to try to work with that, thanks! @arteteco @tilag Hey farm bikes are a great idea! 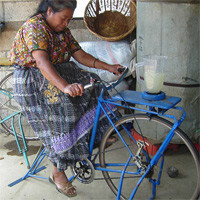 I learned about coffee bikes (cargo bikes for coffee farmers) and people powered farm-machine (bicimaquinas) like Maya Pedal at a #BikeBike workshop a number of years ago. Peace Coffee here in Minneapolis moves coffee by longtail cargo bikes hauling Bikes at Work Trailers. Such a setup would be great for urban farm CSA deliveries, and hauling woodchips or compost. Really cool links and ideas, thanks! @Stoori @tilag #bicimaquinas son el futuro! Bike machines are the future! re planning to do... and...it's 'local'!! Meaning? ?